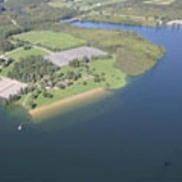 Located in Carbon County, the 2,972-acre Beltzville State Park is developed around the U.S. Army Corps of Engineers flood control project – Beltzville Dam. Beltzville Lake is 949 acres with a shoreline of 19.8 miles. The park is located along the Pohopoco Creek with recreation areas around the lake. The park offers wooded and open picnic areas, which include modern restrooms, drinking water, tables, parking areas, and day-use mooring areas for boats. The lake also is ideal for fishing and motor boating and sailing.